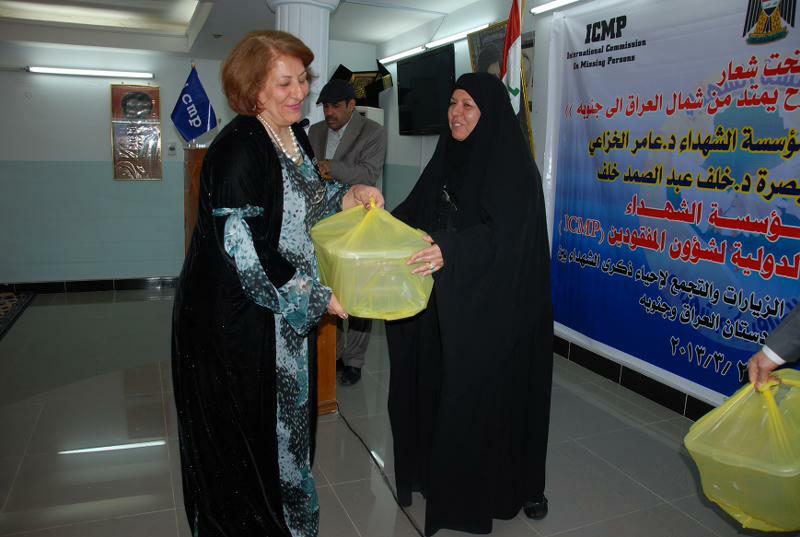 The International Commission on Missing Persons (ICMP) together with the Martyrs Foundation’s Basra branch organized a four day visit, between 23 to 26 March, of eight women from Iraqi Kurdistan to Basra. Participants of this event are survivors of the Anfal Campaign, the bombardment of Halabja and other crimes committed by the former regime. As part of the visit, the participants met representatives of the local authorities, visited different historic monuments and paid tribute to the victims of the Shi’ite insurgency of 1999 at the Martyrs Monument in Basra City. This event followed the visit organized by the ICMP in June 2012 for 14 women from Basra to the Kurdish region. The BiH Chief Prosecutor Goran Salihović met with the Director General of the International Commission on Missing Persons Ms. Kathryne Bomberger in Sarajevo today. Mr. Salihović and Mrs. Bomberger discussed efforts needed to accelerate accounting for missing persons in BiH. It is estimated that 9,000 persons missing from the armed conflicts relevant to Bosnia and Herzegovina are still unaccounted for. The UN and ICMP held consultations today with forensic experts from Bosnia and Herzegovina. The experts presented their views on the current situation of forensic science in BiH and proposed areas and methodology for improving capacities of this scientific field. They identified branches of forensic science in BiH which currently do not exist, as well as areas for improvement. The Ambassador of the Kingdom of the Netherlands, H.E. Ambassador Jurriaan Kraak, visited the Identification Coordination Division (ICD) of the International Commission on Missing Persons (ICMP) and the Podrinje Identification Project (PIP) in Tuzla today. Ambassador Kraak said that he was pleased to see the excellent work of the ICMP to which the Government of The Netherlands has been one of the largest donors. The International Commission on Missing Persons (ICMP) recently received skeletal samples and blood reference samples from Libyan authorities related to the high-profile case of the Bin Jawad mass grave. ICMP carried out the DNA analysis in its laboratories and compared the profiles of post mortem samples with blood reference samples obtained from families of the missing. As a result, 95 positive DNA matches were made of different individuals. A press conference was held today in Sarajevo to announce a new donation from Microsoft to the International Commission on Missing Persons (ICMP). The commercial value of Microsoft’s software donation is 480,000 USD, and includes Windows, Office, Windows Server, Exchange Server, SQL Server, Visual Studio and Lync. The International Organization for Migration (IOM) and the International Commission on Missing Persons (ICMP) have concluded an agreement on cooperation in matters of common interest. A formal agreement was signed today in Geneva, Switzerland, by IOM Director General William Lacy Swing and ICMP Director General Kathryne Bomberger. According to the agreement, the main areas of cooperation between the two international organizations will be to address the issue of missing persons from migration, displacement, human trafficking, and other causes. IOM and ICMP will also cooperate in conducting research studies on matters of mutual interest and other areas.